The new search engine is the redeployment of the computing network that Google uses to connect searchers and results. The search engine can change how the company ranks in its search engine. The companies will have to change their Search Engine Optimization(SEO) to protect their Google ranking. Google is not changing the user interface as part of the Caffeine update. So the average user is not likely to be surprised by the way results appear. The update does not affect the ranking of ads on the search engine. “For the last several months, a large team of Googlers has been working on a secret project: a next-generation architecture for Google’s web search, it’s the first step in a process that will let us push the envelope on size, indexing speed, accuracy, comprehensiveness and other dimensions,” wrote the company blog. “Google makes constant changes to its search algorithms and infrastructure, but such a change in this magnitude has not been done since 2006,” said Matt Cutts, Principal Engineer, Google. 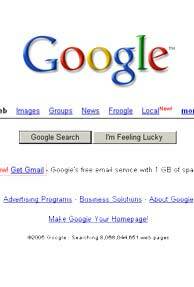 The search page is identical to the classic, clean Google web page. Google is opening a web developer preview to collect the feedback regarding how Caffeine performs compared to its current search engine and is not looking for comparisons to offerings from rival internet firms. Microsoft has been praising the momentum of its recently-launched Bing search engine and is believed to take long term approach for closing the gap with Google. Microsoft has also announced a tie-up with Yahoo. Google has a two-third share in the search engine market, as Yahoo stands second and Microsoft at third in a search engine market. Google has added a new feature to enable users to find and access their Google documents straight from the desktop. Here is the link on how you can access that.